Olan is an important dish in our home town for feast, the sadya as we call it. Whether it is for a marriage or festival feast it is a must, just like cranberry sauce for Thanksgiving dinner. By the way Thanksgiving is just around the corner. Hope those who celebrate have already bought the bird. Only brining, cooking and serving are left. I don’t eat meat so our Thanksgiving will be without turkey. Last week it was really mess in our house as our gas range was giving lots of trouble and we ended up calling the service guys, got frustrated with them and finally ended up buying a new stove. It was really sad for me to get rid of the stove as I loved that stove very much. As pregnancy hormones are in high swing, it was really difficult to take this frustration. I don’t know if any of you have an army of maids to take care of everything, then I guess, one won’t be frustrated so much. Any way after lot phone calls and visit to local Lowe’s store from where we had bought the stove, and they agreed to give back some money. We had bought the stove for $1650 dollars and they agreed to pay $1270 dollars, rest is gone in drain. Okay I will stop my rambling and come back to Olan. Olan is a mild stew usually cooked with winter melon/ash gourd, yard long beans and red kidney beans. Some time pumpkin is also used to make this stew. It gets a slight hint of spice from green chilies used. 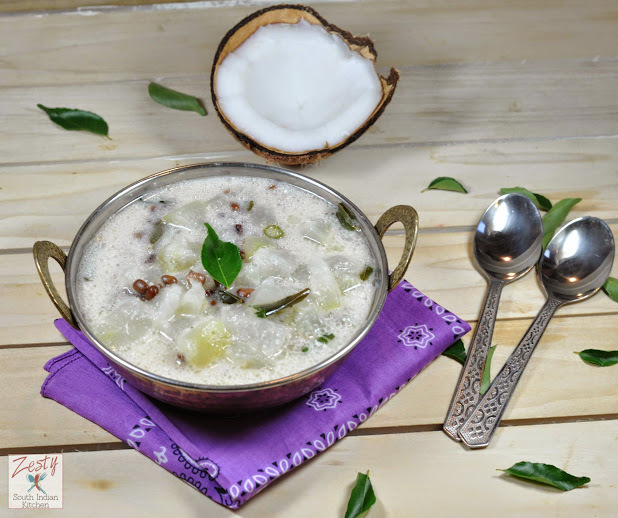 Even though it is coming from the spice land Kerala, it is devoid of any spice, and is dredged in coconut milk and flavored with coconut oil and curry leaves. 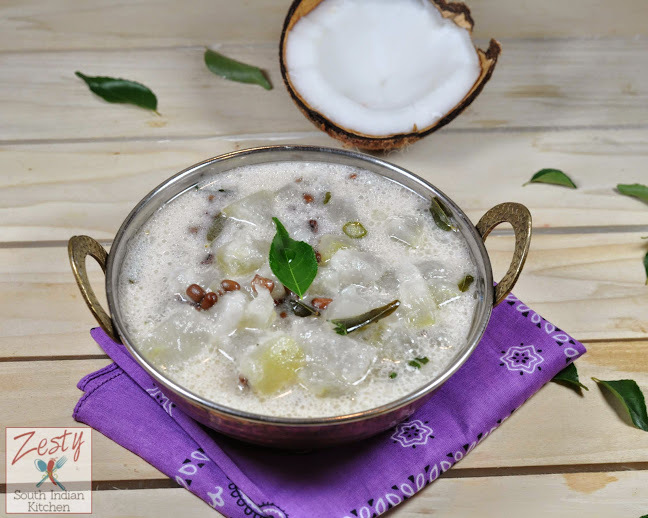 Winter melon/Ash gourd is widely used in Asian cooking; in southern India, they make curries with them, where as in the northern part of India and Pakistan they make candy called Petha with Winter melon. In china they make soup with it. Furthermore, it has several health benefits such as help in reducing obesity by increasing the metabolism and thus reducing conversion of fat to sugar. It prevent acidity, ease constipation, relives cough common cold and bronchitis. It also cures urinary dysfunction and infection. It also enhances health of oral cavity and hair. If you want read more from here. As I always mention, our feast has myriad of tastes, it has salty, spicy, sweet, bitter and with variety of dishes. This olan is a mild curry without any seasoning, and is usually served with rice and other dishes. I made it, just like my mom always did. Here goes the recipe. 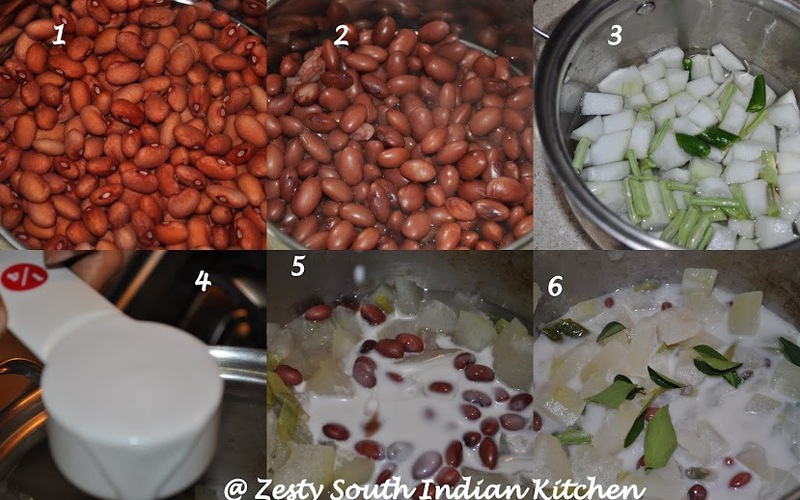 In a pressure cooker, wash and cook the kidney beans for about 2 whistles or 15 minutes and set aside. In a medium sauce pot add chopped vegetables, green chili, salt and 2 tablespoon of coconut milk and water and cook for about 20 minutes or until the vegetables get cooked but not mushy. Once the vegetables are done add rest of coconut milk and cooked beans. Finally garnish with coconut oil and curry leaves. Enjoy with rice and curries. beautiful pics! love the presentation! If you can, please go through the rules of my Ongoing event: Healthy Lunch Challenge & link yuor post there. Authentic and delicious recipe.. looks inviting !! Olan looks fabulous and inviting. Olan is so delicious and yummy! Olan is an all time favorite…love it any day. Thts a yummy bowl of goodness..yummy! I’ve never heard of winter melon before but with all of these other awesome components, I know I’d love this dish! wow awesome curry….my hubby will love this! Olan looks simply delicious and awesome. Olan looks so delicious.I love it. beautiful pictures and recipe. I liked it. Superb one, looks so creamy and delicious. Classic Kerala dishes are always appetizing. i am a kooyu lover that i can gobble up all of that. I loved your very first picture in this post. Very inviting! Interesting and innovative dish. Looks yummuy, flavourful and healthy too. This sounds like such a comforting stew Swathi! Wow…super delicious and healthy too! Wow, what an interesting dish! My neigbor used to tell me abt this. looks yummy. Looks delicious Swathi! Love all the different flavors together! 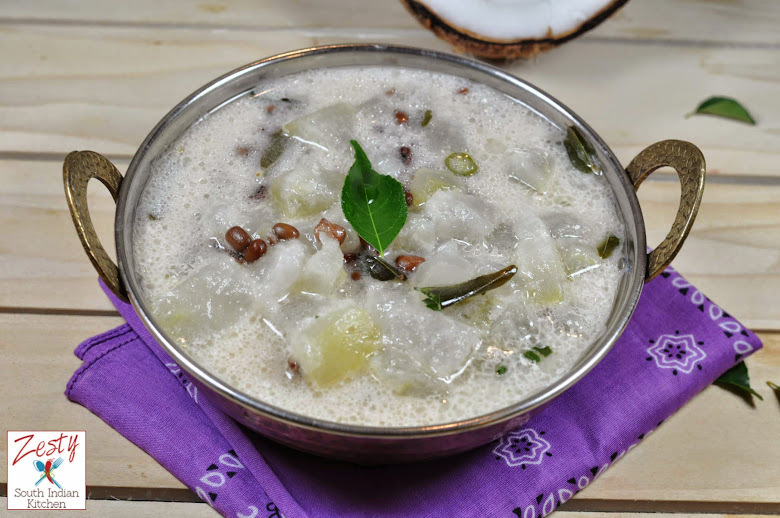 Swathi, I love winter melon and most of the time, my mum will double boil it with lots of condiments inside the melon. I would love to try this way of preparation. It sounds so good. coconut milk is always a good thing. That sounds like a great combination, Swathi. Looks like perfect comfort food. Looks so delicious…love the pretty presentation, as well! I meant to tell you in my latest comment that I like the new look of your Template on your blog, and the crisp clean look! looks so tasty….gReat with some hot rice..